Welcome back Guild Ball fans, how are we all today? Last week we spoiled Veteran Fangtooth, the biggest, baddest boi, (and if you missed that reveal you can find the blog post here), and we only have two spoilers left from the Faithful box to share. 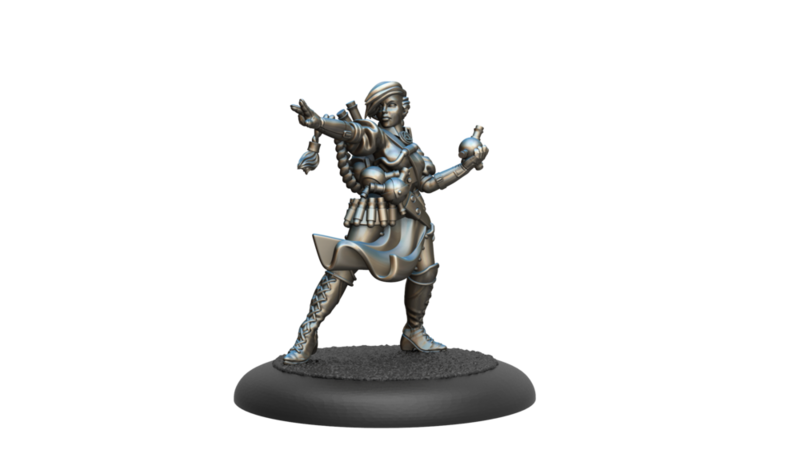 Today we’ve concocted you up a nice treat, it’s a look at the latest Alchemist to burn her way into the ranks of Guild Ball, it’s Veteran Calculus! So, pretty simple card, this. Calculus has maintained her 1” melee zone, and most of her stats from her original version. She has gained a TAC though, and 2” of KICK range, which gives her a 16” Sprint and Shoot distance, which pushes her into ‘off-striker’ territory. TAC 5 is also that break point at which she can reliably hit her first column against just about any model in the game. It’s also worth pointing out she’s kept her DEF/ARM stats of 4+/1, which is a very solid defensive statline to have. Speaking of her Playbook, she has a good array of momentous results, starting with a Dodge on column 1, and a Tackle on column 2. This helps show her focus, she’s supposed to be chasing down the ball and snaffling it off of enemy players. A momentous Push/Dodge on column 4 and a Tackle/Dodge on column 5 are her final momentous results, again giving her plenty of options for manoeuvring around and grabbing the ball off people. Non-momentously, she has the standard 1 damage on column 1, then a double Dodge and 2 damage on column 3, and finally a non-momentous 3 damage on column 5. The double dodge is certainly helpful for her to get around the Pitch if she needs to move a bit further at the cost of not generating momentum, while the damage results allow her to ping some damage and hopefully finish off an already wounded model. If Calculus can get some gang ups from friendly models, she can actually do a nice bit of damage. It’s not her first choice, but it does give her that option if need be. Veteran Calculus has a single Character Play, which is where the title for this section of the blog came from, called Sticky Bomb. This unique Character Play allows Calculus to control the enemy team by limiting their movement. While -2”/-2” Movement isn’t an enormous debuff by itself, when combined with the other movement control options in Alchemists, it can really slow down an enemy team. The main one to mention here is the burning condition, which the Alchemists have a *tonne* of access to, as well as snared on Midas’ Legendary turn. 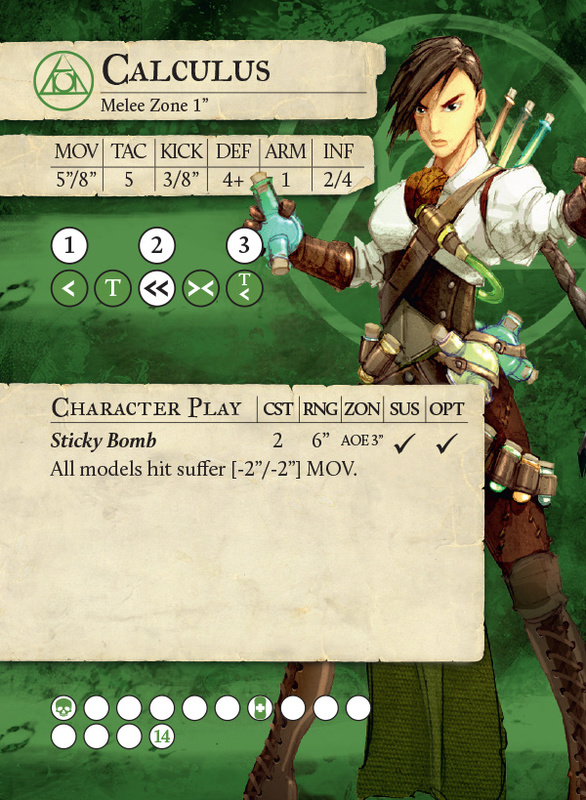 And of course, we can’t forget Blind from Hemlocke (at least until the £#$p£”()?^/\s Minor Guild is released!). Stacking these multiple movement penalties on the enemy team allows the Alchemist player to pin their foes in place while they move around and control the ball, safe from retaliation. Even if the opposing team can clear burning or snared in order to get to your players, this forces them to spend Momentum to do so, and means the player in question can’t heal during their activation. This is always a tough choice against Alchemists, which Veteran Calculus makes doubly difficult. It also means they’ll struggle to get into the positions they would ideally like to be in, which aids the Alchemist player with planning Counter Attacks and their own positioning. The back of Calculus’ card also has two unique rules, Spillage and Extraction. These rules combined are interesting, not only in their effect, but in how they give hints towards the Alchemist playstyle in Season 4. 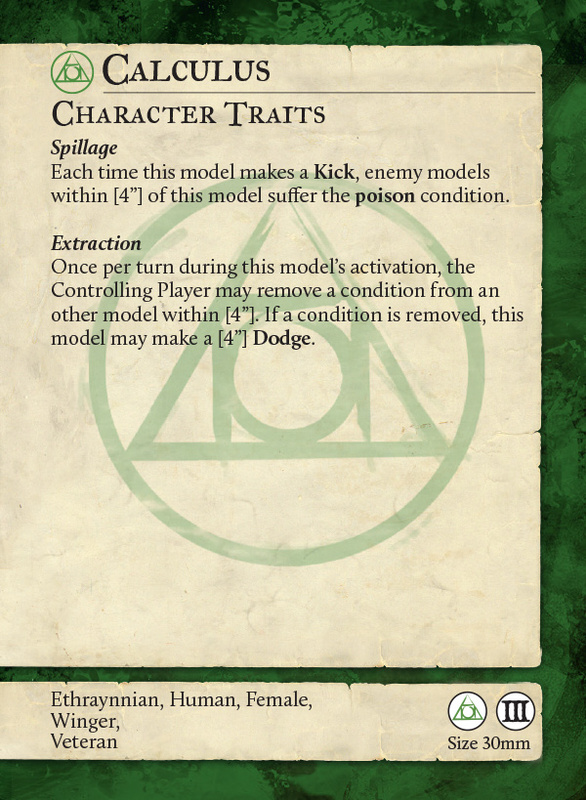 Spillage is one of Calculus’ strongest links to her previous version; this rule inflicts the poison condition on enemy models within 4” whenever she makes a Kick. This is a cool rule, since it’s basically free. She doesn’t have to pay any additional resources to inflict poison, it just happens if any enemy models are nearby. This generally adds insult to injury for people playing against Calculus, she either retrieves the ball and kicks it clear, or scores a goal, and poisons everyone around her in the process! Also note that the Kick doesn’t even have to be successful, she still poisons everyone anyway. Spillage also interacts well with her next Character Trait, Extraction. This rule allows her, once per turn, to remove a condition from a model within 4”, and if a condition is removed, she may make a 4” Dodge. This rule is basically super Where’d They Go?, allowing her to not only clear, say, knockdown from a friendly model, but also giving her a 4” Dodge in the process. Without even spending Influence! This rule gives her a 20” goal threat before we even start looking at Playbook Dodges or other methods of moving her around, which pushes her up into actual striker territory. It’s positional, of course, she does need a model nearby that is suffering conditions, but with Alchemists that’s not generally a problem. It’s also worth noting that she can pull a condition from an enemy model in order to make the Dodge too, which drastically increases the flexibility of this rule. While removing a condition from an enemy model may feel a touch counter-intuitive, this was an area of design space we wanted to actively explore, that of the Alchemists using conditions to ‘pay’ for abilities. Really it just provides more options and push/pull mechanics for the Alchemists, allowing them to choose between leaving the condition on an enemy model or taking the Dodge with Calculus. Sometimes one will be better, sometimes the other. Guild Ball is about choice, and this is a really interesting decision point. Of course, if there’s a friendly model nearby suffering a condition, well, it’s all gravy. Or possibly acid. Whatever the Alchemists tend to pour on their food, we dunno, we’re not scientists. The combination of these rules provides some hints towards the direction of Season 4 Alchemists, particularly the removal of conditions in order to pay for abilities. Allowing them to ‘spend’ conditions to fuel abilities is a really cool design space, and it’s one we’re excited to explore. And there we have it, another spoiler over and done with, Veteran Calculus in all her chemical glory. Let us know what you think on our social media and forums, and if you think she looks like quite the formula for success, you can pick up the Faithful box here. Next week, well, sorry Blacksmith players, someone had to be last. But next week you’re finally going to get your first look at Veteran Cinder, the Flame of Vengeance! Happy Guild Balling!